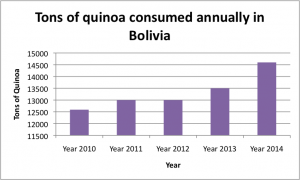 The price of quinoa in the local market here in Bolivia has dropped more than 50% since last year’s highs of 1,200Bs (Bolivianos) a quintal just 500Bs a quintal ($.32 a pound). Consumption jumped almost as fast as prices have fallen with 14,600 tons of quinoa being consumed in Bolivia last year. Quinoa production is also at an all time high with almost 439,000 acres under cultivation, 10% more than the previous year. “This national and international promotion of the “golden grain” (quinoa) has pushed production and consumption of quinoa in this country and the rest of the world. And though this grain can be produced in other countries, none has the nutritional content of the grain produced in Bolivia.” Explained Edgar Solis yesterday, the Director of the International Center of Quinoa. 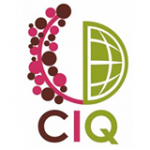 The Centro Internacional de la Quinua-CIQ (or International Center of Quinoa) was created by direction of Bolivian law #395 as a way to unify and trademark Bolivian Quinoa as an original product of origin. There are over 3,120 different types of quinoa in Bolivia with many different properties. Some are high in oils, others high in protein, others low in calories, and some high in saponin a byproduct that has medical and biological uses. Quinoa also comes in a full range of colors from white to golden yellow to bright pink, red, purple and the darkest black. 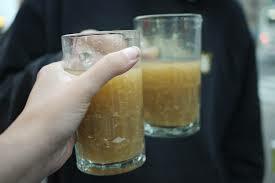 I enjoyed some hot quinoa drink (refresco de quinoa) this morning taking the bus from Cochabamba to Oruro to meet with Jorge Guzman plan the next part of my trip – the salt flats! 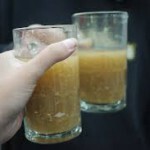 The drink is a warm, watery mixture of quinoa flavored with cinamon and sugar. Delicious!